(CNN) – Richard Sherman lent a hand to Michelle Obama's hallmark "Let's Move" campaign, spoofing his widely aired NFL postgame rant - this time, in the kitchen. As a part of the first lady's efforts to combat childhood obesity, the Seattle Seahawks star appeared in a video released by the White House on Thursday promoting healthy eating. 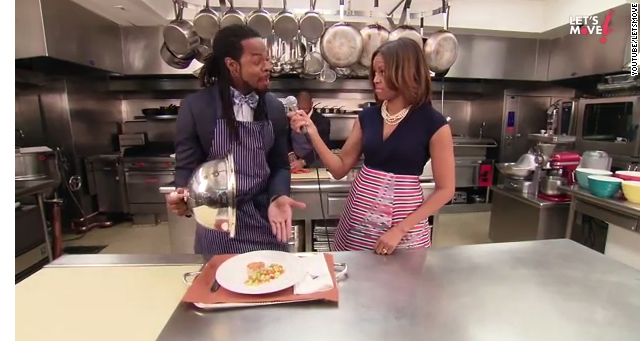 "Richard, take me through your final plate," Mrs. Obama said to Sherman after the video shows the Super Bowl champion cornerback whipping up some wholesome grub. "Well, let me tell you, we the best chefs in the game," Sherman said - mimicking his extensively publicized postgame rant earlier this year after making an amazing defensive play to seal his team’s trip to the NFL title game. "So when you try us with an easy meal like salmon cakes and succotash, that's the results you're gonna get," he said displaying his culinary work. Sherman's the latest pro-athlete the first lady's recruited to help with her "Let's Move" initiative. In January, she showed off her basketball moves in a video with the Miami Heat, last year's NBA champions. Mrs. Obama’s continued push on her healthy eating efforts follow her rare foray into the political fray. On Tuesday, she argued that it's "unacceptable" for House Republicans to consider making major changes to the 2010 child nutrition law. And on Thursday, she took to the pages of the New York Times to accuse the GOP of trying to "override science" for trying to adapt the law. How is it, Barry gets older looking by the week, and Michelle seems to look younger all the time? They make a great First Couple! The FLOTUS has got star power behind her. First the video with the Heat and now this. I'm cracking up. This is going to make rwnjs heads explode. This would be funny...but it isn't. I can find nothing amusing about the Obama family. Every instance of them irritates and angers. Half of the nation (at least) is opposed to their every action. why does the msm always hide michelle's big backside in these pictures??? would it undermine her programs about obesity? FLOTUS programs are actually affecting childhood obesity numbers. There is nothing more annoying to conservatives than liberal programs that are working. Get over it. First of all Bill, his name is Barack not Barry. @Silence-What study has shown a drop in childhood obesity due to M. Obama`s programs? "why does the msm always hide michelle's big backside in these pictures??? would it undermine her programs about obesity?" Thanks for your racist input. We'll just add it to the overflowing pile of proof. But before we do, would you like to add a "badonkadonk" or maybe a "shelf booty" to your comments for some bonus bigotry points? "I can find nothing amusing about the Obama family. Every instance of them irritates and angers. Half of the nation (at least) is opposed to their every action." Aaaw...poor thing. Do you need an infusion of White-POTUS, stat? I know one thing spewing she's in way better shape than either of those former ones. Well you're at least being honest. That your hatred isn't based on any policies or facts, just them. Lies are known to republicans., wrong wars, wrong kills, wrong guns etc. The FLOTUS food quest is simply unequalled addictive to ugly growth of obesity in US. Food is virtually everything growth in human....health, strenght, wisdom/intel, even life as a whole. Just that American Democracy is being re-invented by GOPers to mean "biting the finger that feeds you". Did he yell real loud and scare her? It's a GD shame that no matter what the Obama's do, people have to spew your nasty hatred. You people sicken me. She's trying to do something good and all you can do is spew negativity. But what should one expect from a bunch of jealous pasty losers? Just look at the poor things arms ? What that from working in the rose garden ? Her old man best not lie and be sassy to moma girl .